Wednesday night’s boxing event at The Foxwoods Resort in Mashantucket, Connecticut was a special birthday bash for rapper/actor slash boxing promoter Curtis Jackson, aka 50 Cent. The night promises to be a rosy one for Jackson - when two of his fighters, Billy Dib of Australia and Ryan Martin scored twin wins for his promotion in the early goings. And then came Jackson’s main event offering over ESPN and his main event fighter, Mark “Too Sharp” Davis battling for a future title fight against Michael “Hammer Fist” Farenas who is not only out to prove himself tonight but is also looking to ruin Jackson’s birthday. “Hindi natin siya bibigyan ng magandang birthday.” (I will not give him a good birthday.) Farenas told this writer Monday night and laughed so hard after that reply. But I can sense the seriousness in him, a fighter who wants to make that one big and probably last push to fight for a title belt. Farenas did both tonight. He stopped Davis in the 8th round after dominating him all night and he may just have turned the night sour for Jackson who has a planned big birthday celebration and party after the fight. The previously unbeaten Davis was beaten by the hard-hitting Filipino southpaw from the get-go. Farenas’ left straight, hooks and uppercuts to the body and head were too much for Davis, who suffered a cut in his left eye in the first stanza of the bout. The fighter out of Gubat, Sorsogon in the Philippines hit Davis round after round. Davis was unable to avoid those hard lefts from the Filipino southpaw. He was hit hard and almost went down in the 6th and if not for the bell, Davis would have tasted the canvass of the Foxwoods arena. The doctors and Referee Steve Smoger took a serious look at Davis after the 6th and both warned his corner that they are contemplating in stopping the fight after witnessing him take serious punishment from Farenas. Davis answered the challenge by coming back strong in the 7th - throwing combinations that caught Farenas, in what could have been the only winning round for Davis. Then the 8th round came and Farenas decided that enough is enough. He launched a vicious left hook that catapulted Davis from the center of the ring to a corner post. He then followed that up with two unanswered combinations that hit the target. Smoger had also seen enough and stopped the fight after that salvo, awarding a TKO win in the 59 second mark for Farenas who impressed American audiences again in his second big fight in the United States. Farenas gained admirers when he gamely fought a losing war to another of Jackson’s fighters in 2012 in Yuriorkis Gamboa in Las Vegas and HBO. Farenas will now climb up the rankings of the International Boxing Federation (IBF) junior lightweight (130 pound) scales and position himself as the mandatory challenger to the belt. That belt will be contested next week by current champion, Argenis Mendez and challenger Rances Barthelemy in an IBF ordered rematch slated for Thursday next week in Miami. 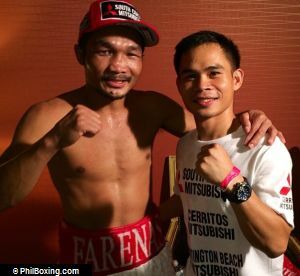 In an interview after his impressive win, Farenas thanked his trainers in the Philippines and at The Wild Card Gym in Los Angeles, his promoter and everyone who was instrumental in his victory Wednesday night. A very happy Farenas told Philboxing.com that he thought he could handle Davis’ punches when he felt them in the first round and that encouraged him to attack his opponent early. “First round pa lang, naramdaman ko na, naramdaman ko suntok niya, na kaya ko, kaya ko siya. Pinagsikapan ko talaga, first round pa lang, pinasok ko, pinasok ko. Gusto kong manalo at gusto kong makalaban ng world championship uli,” Farenas said. Farenas admitted that mixing it to the body and head was the plan against Davis in this fight and one that worked well for him and his team. The recently turned 30 year old fighter is looking forward to fighting for the IBF Junior Lightweight title in the future, once next week’s fight between Mendez and Barthelemy is completed. “Importante talaga ito, kasi sabi ko nga dati, baka huling baraha ko na. Sana sa susunod ay world championship uli. Sana manalo na tayo sa pinapangarap nating belt,” He added. And for Curtis Jackson aka 50 Cent, Farenas relays his greeting, “Happy Birthday.” He said and then he burst into laughter. It may be 50 Cent’s birthday, but Michael Farenas will be the one partying tonight. Photo: Michael Farenas and trainer Marvin Somodio celebrate Wednesday in Connecticut after Farenas' victory over Mark Davis.